When Peter the Great came to the throne of Russia he found the artillery in just as antiquated a state as the rest of the army. At the battle of Narva it performed badly and the whole lot (around 140 pieces) was captured by the Swedes. Needless to say the following years saw considerable reform both in organisation and equipment, and as a result the artillery became the premier arm of the Russian army, playing a decisive role at the battle of Poltava. This is the first field artillery set produced by Strelets, and in it we find two guns and 23 crew. As usual all the figures are different and are engaged in various aspects of serving the guns. All the poses are fine, and include several officers and men doing all the mundane aspects of the job such as carrying water and powder. One man is particularly interesting as he is not serving a gun but using a personal weapon. The figure (second figure in second row) is using a small hand-held mortar resting on his specially designed halberd - a curious but perfectly correct weapon and pose that helps to make this set distinctive. The third figure in the first row is Ibrahim Petrovich Hannibal, a remarkable man of Abyssinian origin who was a favourite of Peter and rose to be an officer of engineers (which were part of the artillery in Russia). The fourth figure in the last row of figures is James Bruce, Master of the Ordnance, who was most responsible for the reforms in Peter's artillery. The men dressed much like the infantry, and wore both tricorns and the kartuz, as correctly shown in this set. Bombardiers (those that served mortars) wore a cap similar to the grenadiers but without a plume, and again this is correctly shown here. Officers largely pleased themselves and followed fashion, and again all those in this set are authentic. Strelets had said they were not sure of their ability to produce good cannon models, given their poor history of making multi-part kits such as the wagon in their very first set. This set marks their re-entry into this area of modelling, and it demonstrates how far they have come, because the guns are pretty well engineered, with all the parts fitting together snugly without any need for filing or cutting. The barrels rest on large carriages which have some detail along the sides although they are very chunky and not visually appealing. The side detail is achieved by slightly sloping the two cheeks, a feature which we don't care for as this was not true of the real thing, but it is not really noticeable. If the guns are good then sadly the figures are not. The sculpting on these guys is not on a par with the best this company has produced, with some fairly vague detail and poor anatomy. We find that the man carrying a barrel on his shoulders has this item passing through much of his head, and some limbs are very thin and flat. Several of the figures have empty hands to take the separate handspikes and ramrods, but these all fit very poorly. On the plus side however there is no flash at all. With this set Strelets have demonstrated that they can deliver multi-part kits that fit together well, but the quality of their sculpting is still variable and comes well short of the best available from other manufacturers. 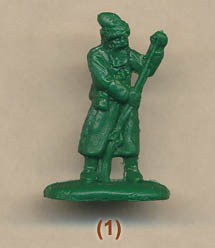 A necessary addition to the Great Northern War range, and some nice ideas on show, but this is a disappointing sculpting job.